Wood - so natural to take care of! The Ultimate Maintenance Guide is here! Welcome to Wood You Like's comprehensive maintenance guide, filled with tips, examples, advice and videos to show you how easy, simple and necessary wood floor care is. But no matter what type of wood floor or finish you have, the surface of the wood floor needs a bit of TLC once in a while to keep its healthy and grand appearance. The best comparison you can make is with your own skin: to keep this important part of the body healthy we often - daily - treat it with feeding and moisturising creams or lotions etc. A flaky, dry skin doesn't look good plus it will not effectively protect your body against outside (harmful) influences. Just like you want to look great and healthy, your wooden floor will look at its best when it's been taken care of regularly. A splash of lotion on your skin is easily applied, and so is treating your wooden floor! That's one of the things this guide will show you - and we'll be using videos to really show you how easy this is. Celebrate our 15th Anniversary with us - see our Special Blogpost page for your discount! The Importance of the wet finger test! Bare wood - no matter if it is a new floor or a sanded down one - looks quite pale, dull even. Applying a finish - any natural finish - will bring out the wood-species natural colouring, which can be rather different than its pale beginnings. This week we received a phone call from a lady, who had bought and installed reclaimed Oak wood-blocks. After sanding the floor down she'd used a tester pot of Osmo HardWaxOil and was very surprised to see her Oak floor turn pinky. When I asked her to do the "wet finger" test on a bare area of the wood floor the result was again a pinky tone, and not as she had hoped the typical Oak colour. The result of this simple and oh so effective test told me the wood-species was something different than Oak. But it had been sold to here as Oak, she told me. Well, American Red Oak is Oak, although I'm not even sure the seller had known the difference him or her self, because as said in the beginning of this article: bare wood of different species can look pretty much alike, especially if the grain structure is rather the same. The lady in question felt rather disappointed ("bummer" was the word she used after discovering the result of the wet finger test) and didn't really know what to do next, perhaps she will stain it an Oak colour now. Especially when you are in the market for reclaimed wood blocks, no matter if it is on offer on Ebay, in a local shop or reclamation yard, you'll have to be sure the wood-species are as claimed. Two simple tools you have to have with you: one finger and a piece of sanding paper. For "finished" blocks: use the sand paper to clear off the finish of part of the block, then do the wet finger test. The finish could be a stain, disguising the original species. Also use the sand paper if an apparent bare block doesn't change in colour after the wet finger test - a sure sign there is a finish on the block. (On Ebay it could be a bit difficult doing these tests, best is always to have a sample send out to you). As you can see, it is really simple to know the result of any natural finish applied to bare (sanded) wood long before you start all the hard work: use the "wet finger" test and never be surprised again! On the subject of maintaining your wooden floor, we receive plenty of questions (by email or over the phone) from many wooden floor owners. Some are straightforward, others we have to do some "de-mything" work. Myth 1: Lacquer floors don't need maintenance? Yes, they do! A varnish or lacquer finish on a wooden floor is in fact a very thin film on top of it. If this thin layer is damaged - by whatever means - the wood is no longer protected against dirt and drips and can show dark, black spots when the floor doesn't receive regular maintenance. This maintenance also keeps the finish layer stronger, plus "fills" small scratches. In the event your wooden floor is riddled with scratches, sanding down is the only solution to restore it to its previous glory. Myth 2: oiled floors need re-oiling every year? No, they don't! An oiled floor only ever needs re-oiling when - if ever! - you sand it down to the (almost) bare wood. What an oiled floor does need - and varnished/lacquer floors too, see above - is regular maintenance with a polish or a wax. The advantage of an oil floor is that, when treated regular, it will become even more beautiful over time, plus it will keep the wood protected against almost everything you can throw at it. Ths products are none-slippery on their own, just be aware that too much applied will not be all absorbed by your floor and can make the floor - temporarily - slippery. Myth 3: maintenance is cumbersome! No, absolutely not! Especially with the modern maintenance products it takes only a few minutes to treat your floor to its "beauty regime", one product even comes is a spray - now how easy is that? But even is you prefer to buff your floor after you've applied old-fashion wax there is a very handy and ecological tool which can help you to make light work of it: our cast-iron buffing block. It weights 7 kg and will do the hard work for you, all you have to do is push and pull - standing upright, no longer on your hands and knees. Believe me, maintaining your floor is as easy as hovering or sweeping it regularly. For more tips and advice on maintenance, why not request our maintenance leaflet - we are in the process of creating The Ultmate Maintenance Guide which will go even deeper into the subject -but this leaflet tells you how easy it really is. Now 9 out of 10 times oiled floors are preferred over varnished/lacquered floor finishes - and most Saicos EcoLine care products suitable for both oiled and varnished finishes; Wood You Like is left with a quantity of maintenance products only suitable for varnish/lacquer finishes. That's right, 50% off the normal retail price (ex VAT), limited quantities in stock, so hurry! and gone is definitely gone! Feel free to drop by, phone (01233 713725) or email us for any enquiry any day of the week, see below for our normal opening hours. We are looking forward to welcome you in our showroom. In our latest newsletter we already mentioned that wooden floors benefit from extra TLC. 'Pampering' your floor by applying a maintenance product every 5 to 6 months will keep the wood protected against dirt and drips and enhance its beauty. Special care is recommended when salt from the gritting on icy and/or snowy roads comes on your floor through wet-shoe prints. Not all entrance mats 'wipe' the bottom of your shoes completely dry. Leave shoes on the mat (or kick off your shoes on the mat and store them in a shoe cupboard - if you have such a novel item - or area that is tiled. To prevent the tiles coming dirty or smutched, put an old newspaper on the floor first). Leave shoes in the porch and have slippers at the ready - warmed-up slippers is really a nice treat after a walk in the cold. Wipe wet-shoe prints dry the moment you notice them so the salt doesn't get a change to effect the wood. Make sure your wooden floor receives its extra TLC. Now 9 out of 10 times oiled floors are preferred over varnished/lacquered floor finishes - and most Saicos EcoLine care products suitable for both oiled and varnished finishes; we're left with a quantity of maintenance products only suitable for varnish/lacquer finishes. That's right, 25% off the normal retail price (ex VAT), limited quantities in stock, so hurry! The most simple way to protect your wooden floor from scratches when moving furniture around is to stick Felt Pads underneath the legs. Using self-adhesive pre-cut rounds couldn't be easier: bursh any dirt or dust from the leg, peel of a suitable sized round from the sheet and press on. Job done. When you are (re)searching products to care or repair your wooden floor, you could be forgiven for becoming overwhelmed by all the products available. Which one, or combination of products, would do everything you want it to do, AND is suitable for it? Do I need an oil when my floor has been oiled before to bring back its lustre, do I need a cleaning product first and what wax or polish can I apply and how often? What products do I need when I only have to add a few blocks to our existing parquet floor, and want to sand and re-finish the whole area of flooring? The list of questions can go on and on. We have a 1950's-1970's parquet flooring in the kitchen and dining room which is in need of some tlc, however as we plan to lift it and re-lay it at a later date when we knock the two rooms into one, for now we would like a 'quick fix' for the kitchen area which is damaged. The floor has a small area which has been covered by furniture which appears to be bare wood, small areas of grey wood where the current surface (wax, polish or oil, i'm not sure) has worn and small areas of water damage. We do not want to sand it at this stage and were planning on using white spirit and wire wool to remove the existing surface coating. What would be the best product to then apply to match the original surface coating? Nice floor! And worth restoring - when the time is there. For the time being you could treat the floor with a suitable maintenance product to keep the wood protected against more water spillages. Wire-wool etc will not completely shift the original finish so there might be colour differences until you can sand everything back to its bare wood again. The best product to use for now - which does mean "hand and knees" work - would be the Power Wax (Solid wax). In the olden days this was used to treat bare wood (a coat of 4 - 5 applied), but in this circumstances you could apply 1 coat over areas still "covered" by the existing oil/wax finish and 2 coats (at least) on the bare areas. Available in small tins or in 2.5 kg tins. Frequently asked: new (or 1 - 2 year old) floor, do I need to re-oil? When you purchase a wooden floor, it should be standard to receive after-care tips. All of our clients receive our maintenance leaflet when we finished installing their wooden floor - or in cases of DIY installation/purchase, together with the materials. It lists the few simple steps you take to keep your wooden floor healthy and beautiful for a very long time. Home improvements of the green variety are set to be the big thing this summer, according to Homebuilding & Renovating. Besides insulating your home, installing energy efficient appliances and lightning fixtures, have you though about adding green credentials to your floor covering? Many homes already have wooden flooring as floor covering, be is pine floorboards, original parquet or even "new" wood-engineered boards. Don't forget that adding wood flooring is no longer a new trend, since the beginning of this century it's right up there among the main choices and increasingly the first option people consider when moving or improving. What has been renewed however, are the finishing materials. Stricter VOC regulations has seen an increase of eco-friendly - and durable - products you can safely use to repair/restore your existing wooden floor. From parquet adhesive to glue back loose blocks (or individual fingers of a mosaic floor), to easy to apply and quick drying floor oils. Most after care products are 100% VOC free and will keep your repaired/restored floor in healthy shape for a very long time. Then of course, there is our famous eco-friendly cast-iron buffing block to assist you both with the application of the new finish as well as with the half-yearly maintenance. FSC and PEFC certified products come from sustainable sources, where not just trees are planted back but whole local communities receive assistance and support to build a sustainable and long lasting income from the forests (as in: a forest that pays, stays). These small, medium and large projects are increasingly found/started all over the world, not just in tropical areas. If your heart is set on installing a new wooden floor to replace carpet - or the old floor is beyond restoration - you have an increasing choice in FSC and PEFC certified wooden flooring products. Hand-scraped or distressed Oak Rustic in natural colours. The floor in this image (Alaska: hand-scraped, smoked & oiled white) complements the original style of the home in such a way it looks as if the floor has been there since the house was built. The advantage of installing new FSC wood-engineered floorboards over existing drafty floorboards: it will stop the draft (without blocking the needed ventilation underneath) and reduce your heating bills. In this article we will show you how you can easily keep the costs of your home insurance to a minimum but if you need further advice or are looking for a quote on renewing your home insurance visit Legal & General. It is the country’s best provider of mortgage-related insurance. Insurers base insurance premiums on risk. The greater risk your home poses to them, i.e. the greater the possibility they will need to pay out on a claim, the higher your insurance premium. Therefore it pays to reduce your risk as much as possible. One way of doing this is to install a burglar alarm. Not only will you deter burglars but you can also slice a good percentage of your home insurance premium. Joining your local neighbourhood watch is another quick fire way to lower you insurance costs. Dead locks, double glazier and security lights also can shave a few Pounds off your premium. The excess is the amount you pay towards a claim. Your contribution can be relatively small, or you can voluntarily choose to increase the excess. Why would you do this? By sharing the risk with your insurer, you will be rewarded with a lower premium. If you rarely claim and when you do it’s only for high-ticket value items, this is one of the best ways to greatly lower your annual insurance costs. However, you should only do this if you really can afford to do so and if you don’t claim often. Along the same vein, choose an insurer that offers a great no-claims discount that increases over time. As the name suggests, if you don’t claim you get a benefit and this benefit comes in the form of a discount. After several years of claim-free living you can get up to 70% off your insurance premium. However, like the previous point, this only works if you don’t claim very often. You should only make claims for expensive items or repair jobs. In the event your wooden floor is affected by a water leak, read our "Wood and Water" case-study and discover how insurers regard your efforts to limit the damage. In her kitchen an Oak floor had been installed (wood-engineered) and, as can happen in areas where cooking is done, in front of the cooker splashes of grease had marked to floor. Knowing how well ammonium can cut through grease she'd used some on a cloth and rubbed away the solidified grease stain. Only to discover a few hours later the Oak in the treated spot had turned a shade darker than the surrounding area! Oak contains tannic acid and, when exposed to ammonium, this acid reacts and becomes darker. It's natural reaction, just think of old cow-sheds, barns or old train cattle wagons. Original Oak from any place where cattle has been for a long while is well known for its very dark colouring. Trying to sand the beams or boards bare to expose the blond wood again is very difficult to do, because years and years of being "exposed" to cattle with their wee, containing ammonium, this natural discolouration has penetrated deeply in the wood, not just stained the surface. This natural process is still being used (in controlled and safe circumstances - SO DON'T TRY THIS AT HOME!) to produce "smoked" Oak. Mostly done in air-thight chambers in a factory, exposing untreated Oak to ammonium vapours for hours. The amount of tannic acid in the Oak, combined with more or less time in this "smoking chamber" determines the natural darkness of the boards. Another name for this process is "fumed" Oak (from the French word fumé). In the "olden days" some exceptional specialist floor companies did "smoke on site", using very strong ammonium in a bare room, sealing off all doors, windows etc. Any draft coming in to the room while this "not suitable for human exposure" was in process would affect the result. And nothing else in the room could be made of Oak, it would get darker too. So, once again: DON'T TRY THIS AT HOME! Note: some wood floors are incorrectly branded - excuse the pun - as smoked or fumed and only have been treated/stained with a colour to resemble this natural effect. The way to find out is to check if the colouring is only "skin-deep" - not even 1mm in the wood - or truly in the wood, at least 1 - 2 mm deep. All Wood You Like's Smoked Oak floors are definitely been in the "smoking chamber". Would spilling cleaning ammonium colour my Oak floor too? No, not that easily - IF the wood floor has been maintained regularly to keep the wear and tear layer in proper condition. The floor in question had not been maintained for a year, and because the area in front of the cooker had had the most "traffic" the protective finish was rather reduced, enabling the ammonium to react with the "bare" wood. Saicos Wax Care EcoLine (VOC free) is now available in the most easy to use container: 1 ltr spray. The minute we received this new product I've used it on our own showroom and really, the easy care of wooden flooring has just become even easier. The nozzle sprays a thin "rain" of maintenance product on the floor, spreads out wide enough to be very economical in use and produces a thin layer which is gently rubbed in with a polish applicator. AND..... it is suitable for both oiled and lacquered/varnished floors, just like the Saicos Wash-Care is. Finally a product range where two maintenance care products can be used on any wooden floor. Order it now in our secure webshop £ 16.04 ex VAT, delivery charges may apply. Who else wants to change to colour of their floor - without sanding? Although nature is a wonderful being, versatile in many aspects, sometimes you just want to chance things a little bit with hardly any effort. The Oak floor you once selected has now matured from its paler beginning to the characteristic honey colour; the pre-finished white-oil Oak boards are beginnings to "grey" or the stain applied to have it look more like a "tropical" wooden floor is fading. Normally you could only change the colour of your wooden floor by sanding off the existing oil finish and to apply the colour of your new preference. Not any longer with Saicos Coloured Wax Care! The Wax Care is indeed a maintenance product, applied once every 4 - 5 months to keep your floor healthy and better protected against dirt and drips, but the three colour versions will add colour to your wear and tear layer. You can choose white, brown and ebony. Simply spread the liquid wax over your floor, rub it in gently without any effort and see the appearance change within minutes! We do recommend you try it out first in a non-obtrusive area to make sure you like the new colour before you treat your whole floor with it. And of course, you will have to apply the colour wax as maintenance product as long as you want to keep this colour on your floor (but only once every 4 - 5 months as you would normally do with the natural wax-polish/care). If your floor is finished with a varnish/lacquer then we're afraid you're out of luck and still have to sand off this finish before you can apply a new colour (coloured HardWaxOil for instance). Changing the colour of your oiled wooden floor has never been so easy. Saicos coloured Wax-Care takes care of this. Hi, can you advise please? I have a herringbone parquet wood floor in my entrance hall and hallway in my house that was built about 60 years ago. Recently I was redecorating the entrance hall and noticed some woodworm flight holes in areas of the entrance hall: some clearly old and some newer looking ones. The specialist treatment I applied needed the surface coat to be stripped away, which I did on the area affected (about a dozen tiles covering about 1 sq m). I did this by stripping and sanding and then treating. However, I am puzzled on how to get back to a matching finish now that I have completed the treatment. It is not a polyurethane varnish as a drop of water leaves a white mark. But danish oil does not give any shine and floor wax does not seem to bring up the shine and lustre. Previous to my treatment, the floor was occasionally polished by my wife with a wax polish. But this, on a trial area, on its own wont bring the surface condition back. Your site looks very informative and helpful. Any advice would be welcome. My local paint shop simply say buy some satin polyurethane varnish, but I am careful about this. In essence, I don't really want to sand the whole floor down if I can help it. When a floor is sanded bare it will take a few coats of wax before it comes back to its shine and lustre. If the floor always has been polished with this wax it would indeed be best to treat the sanded part with this wax too but it might take a bit longer to give you the result you are looking/hoping for. Also bare in mind that when an existing floor is sanded it will lose its matured patina and will show slight colour differences between non-sanded and sanded parts of the floor. This will gradually "fade" to the same appearance. Treat the sanded part with wax, buff it in and give the floor time to absorb it. Then treat it again one or two days later in the same way. Repeat this a few times, but make sure the floor has time to absorb it before you apply the next coat of wax otherwise you'll end with a sticky mess. Very many thanks for this advice. I was getting a bit despairing at getting back the look without considerable effort and expense. I will have a go at your suggestions this weekend. You asked for feedback on how I got on. Well I started on Friday evening and followed your suggestion: particularly to leave it to absorb. The effect has been great. The luster is returning – although there are still patina differences between the areas. I have repeated the treatment and as you say it does blend in better each time. At your service, always more than happy to help out, even if it means re-instating old-fashion methods which now in these (ultra) modern times still prove their worth. Ever been in the following situation? "There’s a knock at the door. You walk towards it, turn the handle, and open it. Your friends have arrived. Is this the moment you’ve been dreading all day? You'd planned to apply a polish to your wooden floor, but you found the bottle empty! Now the floor looks a bit dull. Or are you going to be glowing with pride as they enter, "wowing" at your beautiful wooden floors, bounteously rich in colour, wonderfully warm, and abundantly full of character?" Why don't you join Wood You Like's Easy Maintenance Program - so that you can be assured of getting the best out of your wooden floors too. You don't have to remember to order products in time, we do this for you the minute you join this program! The maintenance product(s) of your choice, delivered by courier at reduced delivery charges, once every year without you having to lift a finger to order again. And we even throw in a free polish application, followed every year with a free replacement woollen sleeve for the applicator. We have had a wood floor laid fairly recently and it has been waxed, which is high maintenance if you want to keep it looking good. I want the floor to have a sheen/shine, would you use lacquer and if so can you over wax. Your solution might lay in our "old-fashion" 7kg cast iron buffing-block, making light work of the maintenance and making your floor looking really good with a shine. You don't need to apply wax or polish that often when you use a buffing block (and applying wax/polish too often can have the reverse effect on your floor, too much and a greasy, sticky layer will keep dust and dirt trapped). If that's not what you have in mind than sanding the whole floor to remove all the wax - using a wax-remover first - and then apply a lacquer could be done, but in our opinion will not look as good or as long good as an oiled/waxed floor does. New: Planning to Install a Wooden Floor? Planning to install a wooden floor? Just a small collection of questions that has found its way to Wood You Like's inbox over the last 5 years. After answering all questions individually the owners/directors have now created a comprehensive manual on installing natural wooden floorboards for diy-ers based on these frequently asked questions. The manual covers all basics from what to note when selecting your own natural wooden flooring, the schedule of works, three different installation methods to the easy maintenance principles that will keep your floor healthy and beautiful and much, much more. Installing a wood floor isn't rocket science - all it needs is some common sense, patience, the right preparations at the right time and of course quality materials and the right tools. 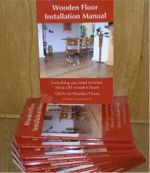 Wood You Like's Installation Manual for Wooden Flooring covers it all: including tricks of the trade to install your own floor like a professional! and order your copy today! "Floored by poor service" - we wonder why. In November we bought a Liberty Oak wooden floor from Allied Carpets for £630 for our children’s playroom. I contacted Allied in February because the floor was worn under my children’s computer chair. My children, aged 8 and 10, weigh 4st 8Ib and 5st respectively and should not be able to wear out in eight weeks a floor with a 25-year guarantee. Allied refused to help because the chair caused the damage. I do not believe that the floor is fit for purpose. Allied should have made it known at point of sale that it was unsuitable for homes with portable furniture. After Troubleshooter intervened the big retailer grudgingly promised to replace the floor. The Chief Executive of Allied Carpets blamed the new supplier (Balterio) for not including after-care guidance to its products. A quick search this morning on Balterio's (Belgium company) website (in English) revealed adequate maintenance and after-care information - including advice on chairs with wheels. Even if Balterio hadn't included a leaflet to the product supplied to Allied Carpets, how about some initiative to give every single one of your clients a standard leaflet on the after-care on any type of floor-covering you sell? We do, no matter if the floor comes with its own leaflet. Our clients are our clients, not really the clients of the manufacturer. Therefore we take care of the after-care - that is, in our honest opinion, our responsibility. You can receive our maintenance leaflet too (including tips on stain removal) by popping in your name and email address in the form below. If your big retailer doesn't want to take their responsibility on after-care for the products they sell, feel free to borrow ours - we're proud to be a small and independent retailer who take customer care very seriously. There are two different types of floorboards: softwood and hardwood. Pine boards are the most frequently found in 'modern' homes. You can of course re-sand them, but that won't reduce the ease with which dents and small damages appear. If you accept this 'softwood' fact then there's nothing to stop your re-sanding the old existing pine boards in your home. There is however one more thing to be aware of: where Oak matures into its characteristic Honey Colour, Pine tends to mature into orange - sometimes quite ugly orange too! Applying a coloured HardWaxOil instead of a natural finish will often prevent this from happening. The colour most used for this is the "Golden Oak", either two coats or one coat Golden Oak and one, the last, coat natural HardWaxOil. So instead of a nicely restored, but turning orange quit quickly, floor you end up with a nicely restored 'golden' brown floor - which could give you years and years of value. Do remember to apply a suitable maintenance product to it once every 5 - 6 months to keep your floor healthy and beautiful. If you are wondering we've turned colour-blind, no - not at all. But how can one wood species be an alternative for two rather different wood species: Teak is brown to grey - if untreated, not maintained for a long period of time - and Merbau is reddish brown with sometimes yellow streaks? Both Teak and Merbau are among the more suspicious forest-deforestation sources (although when Wood You Like lists one or both types in our catalogue you can rest assured it comes from a sustainable source) and so the demand for especially Teak from sustainable sources is much higher than the supply. Teak and Merbau have been used frequently in the 50's to 80's in mosaic floors (the so-called 5 finger mosaic or 5 finger basket weave) and many such floors are now rediscovered underneath carpets. Finding replacement blocks or additional blocks to extend the floor is rather difficult. Now, tropical Mogno (Cambara) 5 finger mosaic is warm brown in colour - less reddish than Merbau but more reddish than Teak. It depends on how old your original Teak or Merbau floor is and if you have to sand it to bring it back to its original luster. Every wood type matures over time, and sanding will remove its aquired patina, almost starting the mature a new. Some of our DIY floor restorers have used Mogno to add to existing Teak mosaic floors successfully and some have used it to repair/restore Merbau mosaic floors successfully. All fingers have their own character, old blocks and new blocks alike - which means the Mogno new addition can blend in, not completely perfect, but still. In our webshop you can find many different wood species in the 7 and 5 finger mosaic catalogue. Or..... how about a complete new floor in Mogno? Warm brown and full of individual character? And rather economicly packed too: 0.67 sq m per pack. UPDATE JAN 2011: Mogno (Cambara) is no longer readily available (due to high demand). In it's place you could try Mahogany 5-finger mosaic to see if it matches your original parquet? The most popular wood type in the UK is still Oak, however there is plenty of choice in warm tropical species to create an unique interior design in your home. Existing rediscovered wooden floors like mosaic and design parquet are mostly made from tropical wood-species. On unfinished Oak floors HardWaxOil is a great finishing product, combining two essential products: oil for long term protection and wax for your wear and tear layer, in one product. Tropical species are more 'oily' on their own than Oak and frequently we hear stories about 'patchy' results when these floors are treated with HardWaxOil. This occurs when the HardWaxOil is not absorbed completely or evenly everywhere because of the 'oily' character of the wood itself. Saicos Colour Wax Clear Extra thin combined with a simple maintenance product or Saicos Premiumd HrdWaxOil. In fact, with the maintenance product, it's going 'back' to the old principle of first sealing the floor and then applying a separate wear and tear layer. With one big difference: the old sealers contained too many VOC's - Volatile Organic Compounds, toxic. Colour Wax Clear doesn't and neither does the maintenance product. You only have to apply 1 coat of oil, wait 2 -3 hours - way quicker too than with HardWaxOil on tropical floors - and apply the maintenance product. Where in the old days hard wax had to be applied and buffed in, with Colour Wax Clear you can use a liquid wax-polish. A great finish to any tropical hardwood floor! Wooden floors and underfloor heating are a good combination, especially when the Duoplank Oak range is used. This particular product is guaranteed which is quite different than suitable. All of course depends on how the underfloor heating system is treated, the maximum temperature of the sub floor (in this case underneath the wooden floor) is allowed to reach is 28 degrees Celsius. Note, this is not the temperature of the water in water systems, the water itself will be warmer and depends on which system you have bought. Please refer to the instructions of the UFH system itself for guidance in this. Underfloor heating is a so-called radiant heat source, 'radiating' its warmth to the room - versus convection heat from standard central heating radiators. Your whole floor in fact radiates the warmth and this should therefore not be obstructed by placing rugs on your wooden floor. Two years after this floor was installed the owner noticed the rug (underneath a table) was lifting. Removing the rug he did not discover a hidden toy what he first thought was causing the 'bump' but the delaminating of one of the boards. The extra insulation of the rug allowed a build up of heat which then softened the adhesive between toplayer and backing to aloow the tensions in the Oak to pull it apart. Underfloor heating and wooden flooring is fine, adding a rug isn't! I am looking for some advice. We have a village hall floor with parquet floor 17.1m x 8.6m which is in need of some attention. 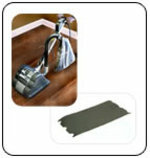 There is a residual lacquer finish on approx 60% of the floor with the high traffic areas with little or no protection. Filled with tips and advice from the professionals on preparations, re installing loose blocks or installing replacement blocks, finding out what wood-species was used in your original floors, how to sand and apply a new finish and much, much more. With ‘work-in-progress’ photos. "Wow, thanks for that -- certainly the best how-to guide I have seen to this. It's always helpful, especially, when something says "Ideally, do ABC, but if you can't, then X Y or Z can happen", instead of just "Do ABC." -- i.e. I know I should remove the bitumen from the floor, but it isn't possible to remove all of it, so it is just good to know what happens if I don't." Buy now for only £ 8.97 and restore your newly rediscovered design parquet floor to its original glory and lustre. A labour of love result that will keep its value for many years to come! Don’t move – improve the hidden treasures your home already has. Increase the value of your home in the most simple and cost effective way! Read this fact sheet on how and why wooden flooring adds long-term value to your home - 95% of estate agents agree. Who else wants a floor-covering that becomes more beautiful over time? This is the only robust floor covering that becomes more beautiful over time! One of the (many) benefits of real wooden flooring is its natural diversity. Every block, strip or board has its own unique character. This gives every floor a truly unique "one off its kind" appearance. No two natural wooden floors are alike. Every wooden floor 'matures' over time, Oak will get its characteristic honey colour, tropical species will become darker. All in a natural gradual way, 'growing' into its ultimate beautiful appearance. A wooden floor only loses this lustre when it is neglected, even those with a gloss varnish finish. If neglected long enough its protecting layer against dirt and drips will also be lost. And it is so easy to make sure your beautiful wooden floor stays ‘fit’ and healthy. Easy maintenance is another benefit of wooden flooring, especially now with the modern high quality liquid polishes. The days of waxing on hand and knees are long, long gone! All it takes really is to apply the most suited polish for your floor once every 5 to 6 months! That's all. If you like you can buff it in deeper with one of Wood You Like's cast-iron buffing blocks - 100% guaranteed to work better and eco-friendlier than any of the electric domestic buffing machines we know of. What will happen with your wooden floor when you take care of it in this simple way? In fact your wooden floor will reward you time after time, with every maintenance care you give it. It will keep its dirt repellent character and will become even more beautiful, showing off all its natural allure for you and your family, friends to enjoy and admire. Select the wood you like and the maintenance products you need. Start enjoying this robust (hardwood), easy to clean, anti-allergic and eco-friendly floor-covering immediately and for many years to come. Natural wooden flooring: a true asset in any home, never losing its value! The most effective and eco-friendly way to maintain your natural wooden floor the easy way! 100% guaranteed! Every wooden floor benefits from maintenance treatments. Modern polishes are easy to apply and our eco-friendly 7kg weighing cast-iron buffing block makes light work of it. New Wood Floor Guide: "3 Easy Steps to Clean and Mantain Your Parquet Floor"
What is a nicer surprise than to remove the carpet from a room in your home and to discover a valuable original parquet floor is hiding beneath it! Especially when you consider that installing a brand new parquet floor costs around £ 125.00 - £ 145.00 per sq m. And that’s just for a simple herringbone or basket weave pattern. Your new discovery will at least need some TLC to bring back its grand lustre it had before it was ‘covered-up’. Follow our “3 easy steps" below and you will start enjoying your valuable, easy to clean and anti-allergic original parquet floor in no time at all. New Wood Floor Guide: "7 Easy Steps to Repair/Restore Your Parquet Floor"
Your new discovery will at least need some TLC to bring back its grand lustre it had before it was ‘covered-up’, see our “3 easy steps to clean and maintain your parquet floor” for this. If your floor is missing some blocks, has damaged blocks – damages from plumbing comes to mind - or you notice areas where the blocks no longer stuck firmly down on the underfloor just follow the 7 Easy Steps below to repair/restore it and start enjoying your valuable, easy to clean and anti-allergic original parquet floor in no time at all. For all materials needed we’ve included a list of quality products underneath. I wonder if I could pick your brains a little. We have just uncovered a parquet floor - 6 bricks @ 4.5"x7/8" in blocks at 90 degree angles to one another. Floor area is 14'x11' & rectangular - no cupboards or inaccessible areas. Mahogany wood or so I'm told - the wood is certainly very dark all the way through. The floor has had some previous repairs after two rooms were knocked together & plumbing works (around 6 years ago). We are planning on restoring the floor to leave it exposed now. To do so we need to sand the floor & then seal & varnish it (need a pretty heavy duty finish as the only back door to our garden is through the living room & we have a dog with a number of very scratchy nails on each corner). Assuming that the floor is prepared & suitably coloured already would it be correct to say that I would need to seal the floor first (~4 hours to dry) then varnish 2-3 times (~ 8 hours to dry between each coating). Is this about right (depending on the specific instructions on any manufacturers products of course)? I am planning on having some quotes for professionals to do this work as well as costing it to do ourselves but I wondered could you give me some sort of 'ball park' idea of the cost of such a renovation? What sort of time frame would you expect such renovations to take? I cannot seem to find anyone registered with the BWFA in or near Wiltshire. Are you able to recommend (or warn me to avoid) any companies local to me? Hope you can help me - I'm trying to educate myself sufficiently as I have invited a couple of companies to quote to me. Thank you for your question. Nice find a floor like that! Who ever is going to restore this floor should note the following: any loose blocks? If so with what material were they glued to the floor - presumably bitumen. Any loose blocks should be cleaned off this black stuff as best as possible, likewise with the any visual residue on the underfloor. Then the blocks can be glued back to the underfloor with modern adhesive, but bitumen residue will have an effect on the bonding time (normally 4 - 8 hours, with bitumen involved it could take upto 24 - 36 hours!). Also, when sanding the floor use a belt-sander not a drum-sander (ask any company who's quoting for this work what type of sander they're plannig to use and insist on a belt-sander). A hard wearing finish could indeed be varnish - modern varnish sometimes include this so-called sealer - but we ourselves prefer HardWaxOil natural which brings out the natural character of the wood better than varnish, is hard wearing and small damages can be easier repaid than when varnish is used. It's hard for us to give you a 'ball-park' figure without having seen the floor in situ - i.e. not knowing exactly the amount of work it would involve - but between low-end and high-end of work needed: between £ 35.00 and £ 50.00 per sq m ex VAT including the finishing materials. Just a quick note to thank you so much for you immediate reply which was much appreciated & which very definitely does help. I also would like to compliment you on your extensive website which I have found fabulously useful & informative. See also our Wood Floor Guide: "7 Easy Steps to Repair/Restore Your Parquet Floor"
Discovering a Oak parquet floor - how to restore? I have just discovered under carpet a floor of oak wood blocks (in a herringbone pattern and in a generally good condition). The location is the hallway (approximately 9 square meters). 80% of the blocks were loose so I have lifted them all and cleaned them as much as I can, however I haven't been able to remove the bitumen (which is generally only a thin layer) that held them to the concrete floor. Once I have relaid them I would like to sand and satin a lighter more even colour. Q: Should I sand down a cupped floor? Wood works, always. It adjusts itself to the moist-content in your home: expands when there is an increase and shrinks when there is an decrease. That's the reason why we recommend to leave a sufficiently wide expansion gap around the whole perimeter of your wooden floor - it gives your floor 'room' to move - and it will, no matter which installation method you use. 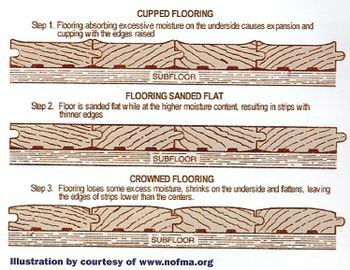 Cupping of a floor happens when the floor absorbs so much moist it fills its expansion gap completely - or is 'stuck' in one spot due to very heavy furniture, faulty installation method - and has to go somewhere - up. Excessive circumstances can happen to everyone: a leak, a flood etc, but those are temporary circumstances. 9 times out of 10 it's a case of 'removing' the cause and the cupped floor will settle again to its normal state. However, we frequently get the question: "Should I sand down a cupped floor?" The picture underneath explains what will happen then (click on the picture to see its full size). It will 'look' fine temporarily, but as soon as the normal house climate is restored the floor will 'crown' - forever! Best solution to resolve cupped floors: find the cause first e.g. leak, heavy downpour causing more moist than normal in the void beneath the wood floor, new appliance in the room or connecting area that causes more moist than normal - think of a tumble dryer, dish-washer etc - sudden and hefty increase in air humidity outside due to the seasons. Some of the causes you can resolve, some you can't - or not easy or quickly. But if you don't know what causes the cupping then you can keep having the same problem over and over again. To reduce the strain in your wood floor that is causing the cupping-effect: remove beading or skirting along one side of the room that runs parallel with the direction the floorboards are installed - wood hardly expands lengthways - and saw or chisel off a small strip of the last row. You'll be amazed how little you need to cut off this way for the floor to 'settle into place again - so start 'tiny', you can always redo the procedure. A circular plunge-saw comes in very handy in these cases - quick and simple. Discovering an original parquet floor underneath an old wall-to-wall carpet is a great and valuable discovery. Specially if the floor is still in one piece, i.e. no rows or tiles removed for installing a central heating system or other 'modern' plumbing work. Restoring the parquet floor to its original lustre is really a 'labour of love', but with the right tools and products it will regain its beauty for many years to come. First up is to remove all carpet residue, like the sticky (rubber) underlayment. Scrapping will get most off. If you need to use chemicals try it out first in a corner behind a door - ventilate the room sufficiently and READ the instruction before hand! Many old parquet floors were stuck down with bitumen which over time can become very brittle and loose its bonding power. Loose blocks (rattling underneath your feet when you walk over it) could be the result. Most old wood blocks have small T&G's all around, lifting one of the block could result in a kind of cascading effect, more loose blocks. So be careful when trying to remove loose blocks. Before you re-install the lifted blocks remove as much of the bitumen from block and underfloor as possible. Any large residue of the bitumen will make the floor uneven, plus the time the modern adhesive will take to fully bond with block and underfloor will be longer - in cases we've seen even days longer! Some re-found original parquet floors only need a bit of extra TLC, remove all dirt and apply a suitable maintenance product. Others however take more work, specially when blocks had to re-installed (or 'new' blocks found to fill in empty spaces), the wear and tear layer is rather damaged (by carpet grippers etc). Then sanding the whole floor is the only solution (such a shame to cover your valuable parquet floor with carpet again!). Before you go out and hire the first sander you can find, a word (two words really) of advice: remove what's left of the old finish material and hire the proper sanding equipment. No matter with what grit you start sanding, if your old floor still has layers upon layers of wax on and in it you'll spend a fortune on sanding sheets! Try out a tiny corner of the floor with a sanding paper by hand. If the paper fills right up and spreads rubbish (warmed wax) all over the floor you'll first have to remove this old wear and tear layer. Apply Wax and Polish remover - turpentine or white spirit based - on a cloth and remove the old layers as best as possible. Again, VENTILATE & READ the instructions on the tin/bottle. For the best end result after sanding your original parquet flooring you'll have to use (hire) a professional belt-sander (and edge-sander). Like the description says a belt-sander has a continuous (or endless) belt, or rather continuous (or endless) sanding paper - called Belt cloth. These belts are very easy to 'wrap' around the drum of the sander (1 minute tops), but most importantly will give the smoothest results on your floor. Most DIY hire centres can only supply you with the (much lighter) drum-sander. Drum sanders have sheets of sanding paper, that has to be wrapped around the drum and fixed firmly in place with a metal bar. This metal bar, when not attached correctly will create shatter marks all over your floor. The problem is that those shatter marks will mostly only show up AFTER you applied the finish product (varnish or HardWaxOil). Trying to remove these marks with a rotary sander will create another problem: circular marks in your floor. So for a 'professional' restored original parquet floor use/hire professional tools. More tips and advice on restoring existing Oak flooring see our Wood-Guide "7 Easy Steps to Repair/Restore your Original Parquet Floor". As all of our clients know we always include a maintenance leaflet - filled with tips and advice to keep your natural wooden floor healthy and 'good-looking' - when we deliver the floor or when we have completed the professional installation of it. Our showroom stocks maintenance products for any type of finish, be it oiled or varnished, of course of the highest quality. One of our products: the Lecol/Leha Wax-Polish - StepStop OH36 - has been named BEST BUY in maintenance products for natural wooden flooring by the Dutch Consumer Union (the Dutch 'Which' organisation). Our price: only £ 13.30 per tin (including VAT), which can cover 70 - 80 sq m! The StepStop is a liquid polish, easy to apply and when regularly used - every 5 - 6 months - will feed the wood and protect your oiled floor against dirt and drips. One of the hardest questions to answer is: what makes a better finish, lacquer or oil/HardWaxOil? First of all it’s down to personal taste and secondly to what is expected of the floor, e.g. easy maintenance, shiny look or natural appearance of the wood. Historical the wax floor is still seen as very labour intensive to maintain, who doesn’t have memories of caretakers buffing away endlessly week after week after week (be it your “Gran” or the school caretaker). Then came the ‘modern’ lacquer (and synthetic and affordable wall-to-wall carpets) and the original wax floor almost became extinct. In this period our web site is being found by a lot by people "Googling" on: floorboard gap; floorboard gap filler; gaps in floorboards, etc. Thank you for your website, it has been a great help. We have new oiled oak floors. The workers who were fixing other parts of the house have created lasting water spots on the floor. They have now said they will have to sand the whole floors to treat those spots. Is that accurate? Does that reduce the value of the new floor? how long the new floor has been down, how long the spillage has had time to cause 'damage' and if the water was polluted (like leaks from central heating radiators) and if any extra oil or maintenance products has been applied before the spillage happened. It could be that the oil has protected the wood from definite staining and that the 'stain' sits on the oil/wax. Rub a small part of the stain with steel wool 0000 to see if this is the case. If so, rub the whole area down with steel wool and apply either the used oil or a suitable maintenance product. If the water has stained the wood itself then light sanding (locally) is indeed needed. Be aware that water spillage can cause very deep and dark staining of Oak. Because your floor has been oiled local sanding is possible. After sanding oil has to be applied again but compared with lacquer or varnish the 'new' area will not create a 'patchy' appearance. Any reduction in value of the floor depends on how deep (if any) the stain has penetrated: how much has to be sanded off locally, reducing the thickness of the boards in that area. Autumn is here. This season means the start of the heating season for most of us: central heating systems are switched on again on most evenings and even in early mornings; wood-fires are lighted on one or two weekend evenings perhaps? Besides keeping the cold outside the heating season also means keeping the humidity out. Radiators (including UFH) and wood-fires lower the level of air-humidity in your home and when not monitored and corrected could cause your natural wooden floor (and your skin!) to become dry (shrinking of the board, dehydrated and itchy skin). To keep both your wooden floor and yourself in good condition in this and next season we recommend you keep an eye on the air-humidity in your home in order for you to adjust/increase the humidity. And there are very simple ways to do this, from having plants in you home, hanging porcelain water containers on radiators and to ventilate your home daily. 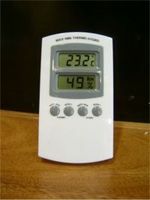 The simplest way to check your home's humidity is to use a Maximum-Minimum Indoor Thermometer and Hygrometer. Available from our showroom for just £ 17.50 (ex VAT, including battery, instructions of use and Wood You Like’s leaflet on House-climate). All natural wooden flooring will benefit from a maintenance service before the real heating season starts: the wax or polish will hydrate the top wear layer of the wood (or the lacquer film) and like with applying a moisturiser to your own skin it will prevent dehydration of the wood. Especially when you have underfloor heating it is really recommended to apply a (extra) maintenance product this month. Not found the tip or advice you were looking for in this category? We will answer it to the best of our knowledge and as quick as possible. If relevant your question will be turned into a new post. "Do you know how to immediately increase the value of your house and comfort of your home?" "7 Easy Steps to Repair/Restore your Parquet Floor"
"3 Easy STeps to Clean and Maintain your Parquet Floor"
Rated 5 stars on Amazon! Wood You Like applies and promotes the Kiss principle (Keep It Simple Sweetheart) in all areas of the business. This means we will give you straightforward advice in plain English and without the technical jargon. Our tips and advice blog covers many areas of Natural Wooden Flooring: from the benefits, installation tips to taking care of your wooden flooring. Here you can ask your own question and we will answer it to the best of our knowledge and as quick as possible. If relevant your question will be turned into a new post for the benefit of our other visitors. As the acknowledged authority on wooden flooring, many architects, interior designers and property developers, nationally and locally, frequently call 'Wood You Like' for advice on choice and suitability of different wooden flooring and advice on the fitting and maintenance. If you have a query, try our 'tips and advice' pages that follow - or give us a call on 01233 877036 for your personal solution to wooden flooring. 1 Wood - so natural!